What is home? What makes a house a home? Home to me is a space that gives me the luxury to be myself, without any restrictions. Home is being with my family, enjoying their closeness in an unaffected, unpretentious way; the liberty to be quiet while being together. Home is the aroma of cooking, home is that little corner that is mine, where I can sit and read, write, or surf the net. Home is where Mahrukh and Che are. Over the last 56 years, I’ve lived in six homes. 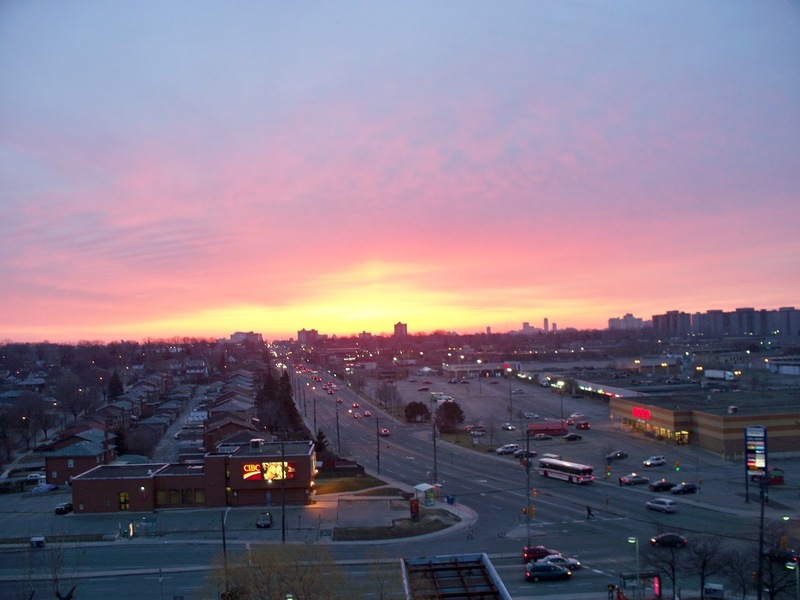 The fifth in my life and the first in Canada – 1117-1440 Lawrence Avenue West – is the one that we remember with great affection. Our minds have an incredible and infinite ability to remember and recall places and people we love. We effortlessly edit unsavoury episodes and focus on the more pleasant experiences. Our first home in Toronto was apartment # 11 on the 11th floor of 1440 Lawrence Avenue West – at the intersection of Keele Street and Lawrence Avenue West. It was the first time we were living in a skyscraper, with a view that was stunning, breathtaking and one that we just fell in love with. We’d stand in the postage stamp sized balcony for hours, and took hundreds of photographs on the ever-changing colours of the skyline at different times during the day and during the year. 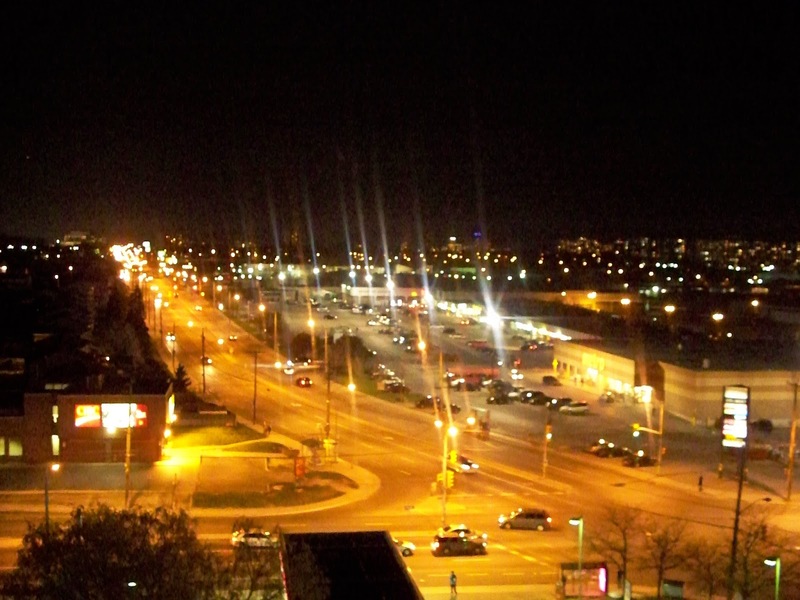 (This post has photographs of Lawrence Avenue West taken from our balcony at different times in a day and across four seasons). The home itself wasn’t much to talk about. It was functional at best. The saving grace was the large windows in both the living and the bedroom. The kitchen was small but separate. The washroom had a bathtub (the first bathtub we had in our home), and another first was the wooden flooring. When we moved in, we had no furniture. 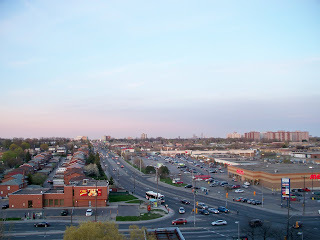 On the first day, after moving in our luggage, we’d to go look for mattresses and took the route 41 TTC bus to Stockyards from Keele Street and got off at West Toronto Street where we saw a sign advertising ‘Cheap Mattresses’. A Pakistani origin woman helped us get the right sized mattresses at the right price. We bought two mattresses and looked for a taxi to get them home, but being new to Toronto, we didn’t know what number to call. Finally, an Indian Punjabi cabbie drove up to us and brought us back home. When he learnt that it was our first day in Toronto, he refused to charge us the cab fare. He told us that he worked in a factory and made good money but had been laid off and had since turned a cab driver. This help from strangers became the theme of our lives for the next few years. In fact, it’d begun when we were in Mississauga. A Brampton Transit bus driver (a turbaned Sikh) took a detour just to drop us off near the place we wanted to go. The place wasn’t on the route, but neither he nor other passengers seemed to mind that he took a detour. Soon after moving in, Maggie, who I introduced in the previous post, and who brought us to the new apartment, also introduced us to some families who lived in these two buildings. Mahindra and Nisha and their daughter; Mahesh and Sunita and their children; Royce and Reena and their children included us in their group and have remained Mahrukh’s friends over the last decade. Other families who came subsequently to 1440 or 1442 (Sati and Kamalnandalan, and their daughters; and Selvi and Ishwar) also became Mahrukh’s friends. Unbeknown to us, our new home turned out to be in a South Asian ghetto, albeit a vertical one and not a horizontal one that we'd seen (and lived) in India. I first realised it when I saw a sign in Gujarati script inside the elevators requesting residents not to spit. Each of the 13 floors (although for superstitious reasons the buildings didn’t have a 13th floor) had over 25 apartments ranging from one bedroom to two bedrooms. A majority of the families living there were from South Gujarat (south of Ankleshwar up to Vapi) and spoke a dialect of Gujarati that my grandmother spoke. Surprisingly, the families were both Hindus and Muslims and in 1440 the Muslim families had even turned an apartment into a prayer room. In the summer months, nearly every senior person who lived in these twin buildings came down to enjoy the temperate weather and gossip. There’d be a few hundred people on the green lawns between the two buildings. It was community interaction like I’d never seen before, and it made me uneasy. I never mingled with my neighbours. I hadn’t flown a few thousand kilometres for this, or so I thought, little realizing that there really was no escaping them. In cold Canada, where living spaces have to be kept airtight, the aroma of Indian cooking remained trapped forever on all the floors and permeated everywhere. Our clothes and bodies reeked of spicy Indian food. Initially, I was unaware of it, and then when I did realize it, was briefly embarrassed, and then turned defiant. Food was part of my culture. I didn’t have to be defensive or apologetic about my culture; that was the whole point of being in Canada, wasn’t it? Living in Canada also meant sharing responsibilities at home for all the unending chores. Mahrukh took charge of cooking, and I took charge of doing the dishes and the laundry. For laundry, I’d have to take our clothes every Sunday morning to the building’s basement to giant washers and dryers. It was an unpleasant task because the laundry room was always crowded. Towards the end of August 2008, the three of us walked to the Amesbury Middle School to inquire about Che’s admission. Unlike in India, where you’d find someone at a public institution (such as a school) even when it’s closed, there was nobody at the Amesbury Middle School. I called and left a message seeking information about the admission process. The residents in our building had misled us into believing that Che would have to repeat a year in Canada. When the school began after Labour Day in September 2008, the three of us went again to complete the admission procedure. He was placed in Grade 6. He looked smart in his new school uniform and confident to face new challenges in a new land. Slowly and gradually, we were settling into a new home, and Che was the first one to hit the ground running. His parents had yet to find jobs, but he was already in school. In many ways, he became a better integrated Canadian sooner than his parents. The journey from Bombay on July 11, 2008, was fraught with excitement and uncertainty. 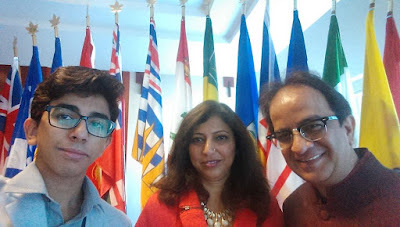 Mahrukh and I had decided that we’d be in Canada for a couple of years to see if we were able to adjust – mentally, but more importantly, financially, and we were prepared to return to Bombay if things didn’t work out. The possibility of returning is a tantalizing one, which we often consider even after a decade in Toronto, Mahrukh more than me. We landed on July 12, 2008, and breezed through the Canadian customs and immigration, with the immigration officer welcoming us with a broad smile. With nearly a dozen bags we had to hire a luggage operator, with a luggage trolley. He was an Indian-origin man, who said he’d charge $20. I immediately began to convert that amount into Indian currency, and reading my mind, he cautioned me. “If you want to live in Canada, stop converting dollars into rupees, otherwise you’ll go crazy,” – a sound advice that took a long time to sink in. At the airport by our agent’s representative Manpreet Singh, a young affable Sikh, and his mother, came to pick us up. But there wasn’t enough room for us and our bags. Fortunately, at that moment, a Muslim (he’d a grey beard) South Asian (he spoke in an Indian accent) person dropped off a family member at the airport and offered to give me a ride to the guest house in Malton. Within an hour of landing in Canada, we were experiencing firsthand the famed Canadian hospitality from a complete stranger. We never met this person ever again. But he left a great impression on us about our new home. The guest house in Malton was a regular suburban townhouse, with four bedrooms on the upper level, a large living room and a kitchen on the ground level and a basement. Not surprisingly, all the bedrooms were occupied by new immigrants from South Asia. A group of Sri Lankans occupied the basement; one of the bedrooms had a Marathi couple, and a young couple from Punjab with a toddler was in another bedroom. We occupied the third bedroom. There was a small backyard, which in mid-July was being used to dry clothes. There was a work desk in the living room with a desktop computer. “It’s for you to apply for a job, work on your resumes,” Manpreet said. A television set, a couch and a dining table made up the rest of the furniture. A fair-sized kitchen had a refrigerator that everyone shared. We decided to take a walk and go for our first grocery shopping at the Food Basics store at the strip mall near the Malton bus terminal. That walk helped us make up our mind – that we wouldn’t be living in Malton for long, and that we’d be moving to Toronto as soon as possible. We’d paid a month’s rent for the room at the guest house, but Malton didn’t seem like Canada at all. It appeared like it was in some deep part of rural Punjab. We didn’t feel like we belonged in Malton. 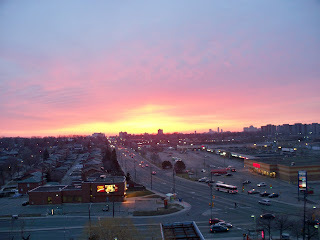 This decision proved to be somewhat hasty and myopic; at least in my case because nearly everyone who gave me a helping hand in the next decade, and assisted me to establish myself in this new place turned out to be a Punjabi, and a resident of Mississauga or Brampton. In the last decade, had it not been for the Punjabis, I’d probably be still working as a security guard in some downtown condo. The first month passed by swiftly. Manpreet helped us open a bank account with TD Bank, he also helped us with applying for our SIN cards, and our PR cards. We went to the Malton Community Centre to participate in its settlement program, where the Anita Shiwnath, a person with great warmth and empathy, introduced us to Canadian work culture, and put us through the writing of our resumes, speaking in public, and all the other pertinent things that’d make us job ready. We used the Malton library to restructure our resumes, creating profiles on job portals and preparing cover letters. From the Malton strip mall, we got our Rogers cellphones. I applied to Summitt Energy and was immediately selected. Little did I know then that everyone who applied for such jobs was selected because the employer didn’t have to pay anything until you were able to sell a package to a consumer. 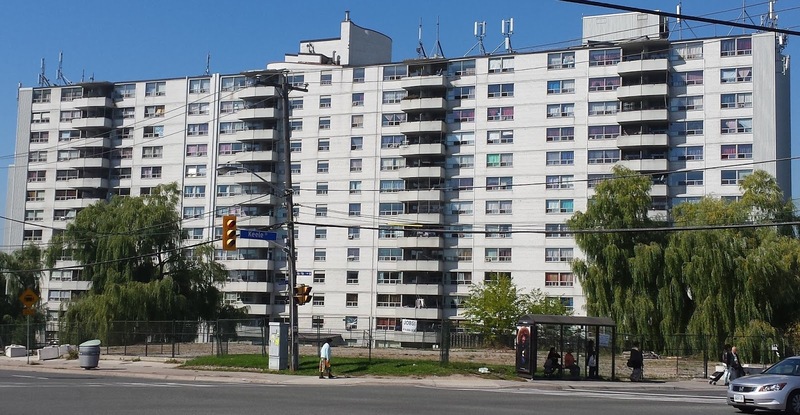 Summitt Energy’s office was at 1280 Finch West, and being new to Toronto, I took the longest possible route to reach there – a bus from Malton to Islington, then a subway to St. George, then a subway to Downsview and then a bus to Keele and Finch. It took nearly three hours to reach the workplace. This was extreme commute even by Bombay standards. In those days, Russian-Canadians dominated the managerial positions at Summitt’s office. I was asked to accompany a group of new immigrants to different parts of the GTA and then to knock on the doors to sell the Summitt Energy’s tariff packages, which would fix the tariff to a specified amount irrespective of the price changes by the hydro company (it took me a while to understand that hydro in Canada meant electricity). I was singularly unsuccessful in selling even a single package to any home, and some of those who were part of my team suggested to the Russian-Canadian supervisors that the reason for my utter failure was my beard. Women in homes in Hamilton, Burlington and other suburban cities where we were trying to sell these tariff packages were afraid to talk to a brown person with a beard. We knocked on their doors in the afternoon, when they were alone and generally suspicious of brown men with beards. The supervisor suggested that I consider shaving my beard. I quit the job. 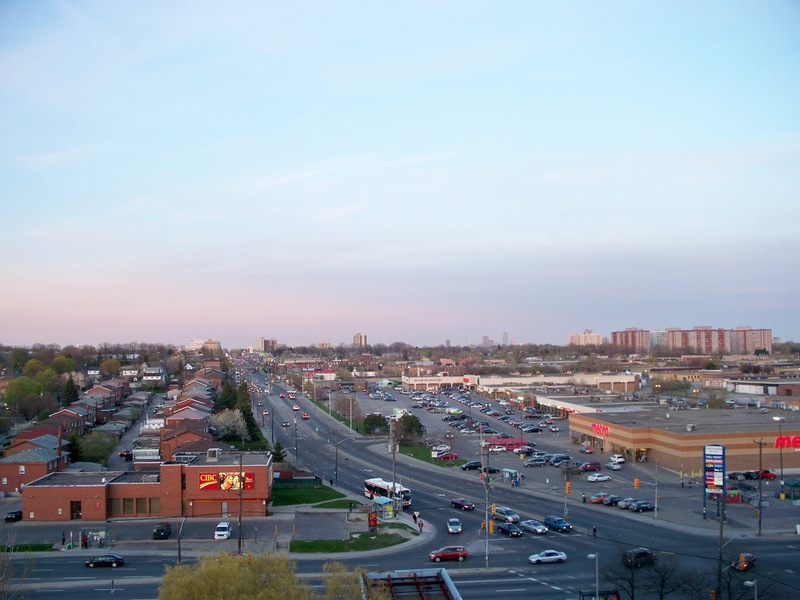 By then, it was time to move out of the guest house and Mahrukh and I decided to take the route 58 TTC bus that began from Malton and went to Lawrence station in Toronto. 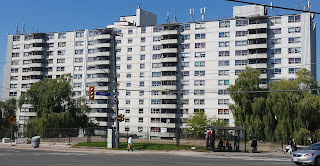 We decided that we’d get off at some point along the route in Toronto and look for a rented apartment. So, in the second week of August, we got into the bus, and after what seemed like a long ride, we got off at a bus stop near a building that displayed a ‘For Rent’ sign. Unfortunately, the door to the building was locked and nobody was at hand to address our queries, so we took a bus in the opposite direction and got off at a stop where we saw another ‘For Rent’ sign. And then, serendipity did its work and out of nowhere, we met Maheshwari Sivappa (better known as Maggie), walking purposefully on the pavement outside the skyscraper at the intersection of Keele Street and Lawrence Avenue West. Hesitatingly, haltingly, I asked her (in Hindi) if she knew whether we could rent a place in the building. She responded with alacrity and led us to the office of the apartment building. 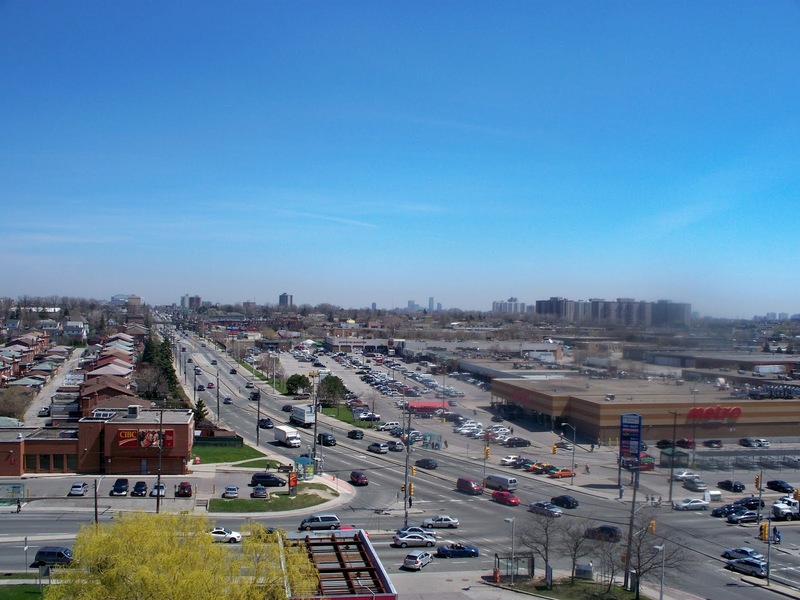 In a matter of minutes, we’d agreed to rent an apartment in 1440 Lawrence Avenue West, because I insisted on a south-facing apartment so that we’d have a view of the CN Tower and downtown Toronto. A week later, with the help of Manpreet, we moved our luggage to the new apartment. 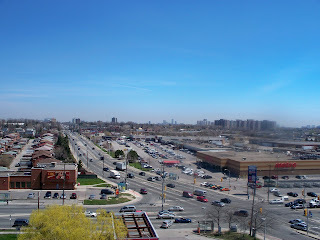 We had our first home in Toronto, and our address was 1117-1440 Lawrence Avenue West Toronto M6L 1B4. 2018 is a milestone in our lives – it’s our tenth year in Toronto. 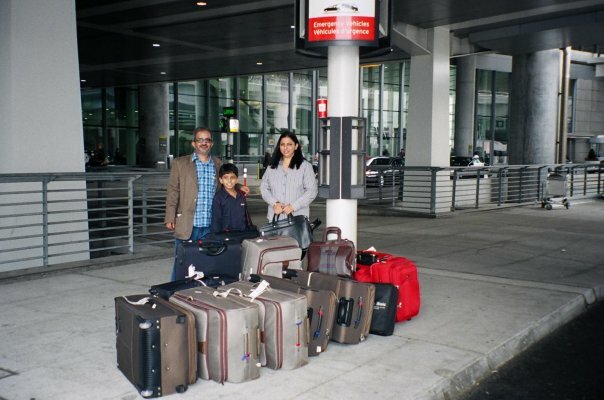 In 2001, we decided to immigrate to Canada. In March 2002, we signed up with an immigration agent. We were promised that we’d be in Canada in 18 months. Mahrukh, with her Master’s degree, had a better score, so she became the main applicant, and I became her accompanying spouse. Che, who was all of five-years-old, was excited as all children are when they see their parents are happy doing stuff together that keeps them excited and smiling. However, after 18 months when nothing happened, we decided to change the agent. Another 18 months went by and nothing happened, and it seemed like nothing would happen forever. You can’t live in a limbo or stop living. 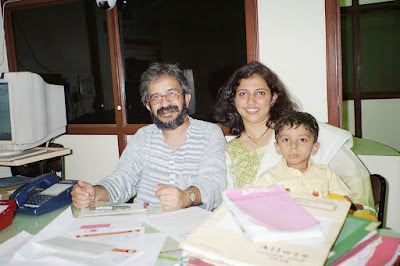 Our hope of ever leaving India receded and we reconciled to our life in Bombay. At the Pearson Airport 12 July 2008, just after landing. The wait continued, and by 2008, we'd all but given up hope of ever coming to Canada. By then, we'd set our roots in our new home in Powai, where Mahrukh and Che made new friends. Then in March 2008, six long years after we'd applied, we got our landing papers, and by July we were all ready to permanently leave India. But, leaving India permanently is impossible. An Indian can never leave India. As they rightly say, you can take an Indian out of India, but you can’t take India out of an Indian. As it turned out, while we physically left India, spiritually we never could. Emotionally, we remain in India even today. Paradoxically, our bond with India is stronger now, after being outside for ten years, than it was when we were in India. I have often asked myself why I wanted to leave India. The answer is straightforward and therefore complex. I wanted to live in a world where our son would be able to decide what he wanted to be without any pressure or unnecessary influence. I wanted to live in a world where I could start afresh in my relationship with Mahrukh. When we applied to immigrate, our marriage was young. Today, we are a few years away from celebrating our 25th anniversary. Did I achieve my objectives? I believe so. Toronto has changed our lives for the better. There are obvious and tangible benefits of living in a developed city that is looking at the future without being shackled by the past. It is fun to be in Toronto at a time when it is firmly anchored to the future and is investing all its resources to ensure that it will continue to be among the best places in the world. As everyone who knows me knows I don’t own a car (and never have and never will). While in Bombay, I dreaded the commute from home to work and back on the city’s famous suburban trains. The experience of using public transit in Toronto and across the GTA is so much more pleasant, and it promises to get better. But I don’t want to make this into a comparison about my former and present home. This about my decade in Toronto. I refrain from calling it my decade in Canada because I've not been anywhere outside of the GTA in the last decade, except on a short five-day tour of Montreal, Ottawa, and Quebec City. I've become a Torontonian, or so I’d like to believe. I know some parts of the city through its public transit, and through TTC’s extensive network of bus routes. I say some parts because it’s impossible to know a city completely in geographical terms. But one can live in a city and become one with its ethos. Toronto’s philosophy is acceptance. Yes, there is a glaring absence of equality in terms of opportunity, and there is unacknowledged but evident racism in many spheres. But, by and large, I live in a city where a majority of its inhabitants try to warmly embrace the new and the unfamiliar, despite stray incidents of intolerance. In these ten years, I'd like to believe that I've attempted to become more accepting of differences than before, less prejudiced, less intolerant and less bigoted. It's also the tenth year of this blog. I launched the blog in December 2008 just to create an avenue for myself to write. In the last decade, I've blogged every week and never felt that it was a chore. Today, I also want to acknowledge a few friends who made our lives easier in Toronto. They are: MG Vassanji, Nurjehan Aziz, Puneet S. Kohli, Asha Luthra, Satish Thakkar, Helen Walsh, Jasmine D’Costa, Joyce Wayne, Gavin Barrett, Tahir Gora. There are many more, and I’ll acknowledge them in 2018 as I’ll be writing about my decade in Toronto frequently this year.